Diane Boivin, MD, PhD, director of the Centre for Study and Treatment of Circadian Rhythms, and her team offer you information on circadian rhythms and the disorders associated with them. Some of the first published evidence for circadian rhythms came from studies in plants. In 1729, the scientist Jean-Jacques d'Ortous de Mairan conducted a simple experiment: by keeping a plant in a dark environment, he observed that the characteristic day and night opening and closing of the leaves would persist—even though the plant was constantly away from the sun. It had previously been assumed that environmental light and darkness throughout the day caused these movements. However, this experiment demonstrated that it takes something other than the plant's environment—perhaps something internal to the plant— to explain this phenomenon. The word, circadian, comes from the Latin terms, circa (about) and dies (day). Today, the term is used to signify biological events that reoccur approximately every 24 hours. Early studies found that humans isolated for several weeks from the 24-hour light/dark cycle still maintained a cycle of alternating rest (sleep) and activity (wake) that approximated 24 hours. The persistence of this sleep/wake cycle, even in the absence of daily changes in the environment, suggests that humans have an internal biological clock that modulates behavior. a homeostatic process: keeps track of the need to sleep, increasing the pressure to sleep as one stays awake longer. In other words, the longer you've been awake, the greater the desire to sleep will be. In a practical sense, the interaction of these two processes can explain why many night shift workers have problems sleeping in the day despite having been awake for 16 hours or more. Going to sleep at times when the circadian pacemaker favors waking can result in shorter or more interrupted sleep episodes. From childhood to old age, the circadian pacemaker changes, affecting the changes in sleep habits. In response to the signals from their circadian clocks, adolescents may prefer to go to bed and wake up later. With advancing age the opposite occurs: bed and wake times tend to occur earlier while sleep becomes lighter. Interestingly, laboratory animals bred with mutations in the genes of the circadian clock can demonstrate not only altered circadian rhythms but also signs of premature ageing. Core body temperature also follows a circadian rhythm: in the late evening, temperature can be one degree Celsius higher than in the early morning. In fact, the regulation of heat loss throughout the body follows a circadian rhythm which is closely associated with sleep and sleepiness. At bedtime, body temperature sensors can detect a gradual decline in core body temperature and an increase temperature lost at the extremities (i.e. hands and feet) which are closely associated with the initiation of sleep. The circadian nadir of vigilance, normally reported in the pre-dawn hours, occur at the same time as the minimum in core body temperature. Some hormones are more closely associated with circadian rhythms than others. Melatonin shows a strong circadian rhythm, which typically peaks in the middle of the night. Cortisol affects many body functions, including metabolism and regulation of the immune system. Its levels are highest in the morning and gradually decline throughout the day to reach their lowest point early in the night. More strokes and heart attacks occur in the morning than at any other times of day. Blood pressure also rises in the morning and stays elevated until late afternoon; it then continues to drop hitting the lowest point during the night. Women report changes in their sleep throughout the menstrual cycle with more sleep disturbances occurring just before menstruations. In fact, disturbed sleep is one of the diagnostic criteria for the Premenstrual Dysphoric Disorder (PMDD). 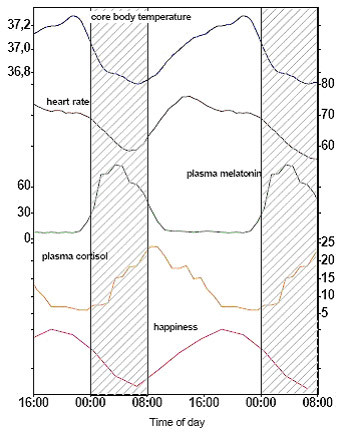 Interestingly, changes in the circadian rhythm of core body temperature are also known to occur across the menstrual cycle, and a disruption of the circadian rhythm of melatonin production is associated with PMDD. This has prompted scientists to further investigate the biological basis for these changes and the relationship between the circadian clock and the menstrual cycle. Blood pressure medication: The important changes in heart rate and blood pressure that occur around the time of awakening could in part account for the increase risk of heart attacks or strokes in the morning. Medication taken at bedtime, is released into the bloodstream hours later, and is most effective during the early morning hours, when blood pressure and heart rate rise most precipitously. As pressure drops in the evening, the concentration of the drug also wanes. Cancer treatment: The application of chronotherapy to chemotherapy in the treatment of cancer seeks to deliver drugs at times of maximal tolerability and efficacy and minimal toxicity. Other conditions such as asthma, hay fever, and rheumatoid arthritis may also be effectively treated with chronotherapy.  This content was developed by Diane B. Boivin, MD, PhD, director of the Centre for Study and Treatment of Circadian Rhythms. A group of “clock genes” are expressed in neurons of the SCNs, which gives the structures their characteristic ability to endogenously generate circadian rhythms. Interestingly, these clock genes are also expressed in other tissues of the body such as muscle, heart, liver, blood cells. There is evidence to suggest that peripheral circadian clocks are synchronized by the master circadian pacemaker in the SCNs. In average, the length of the circadian day is slightly longer than 24 hours. To be more precise, the human internal clock has 24.2 hours in average. If your endogenous circadian pacemaker was left to run unhindered, your internal clock could be one hour behind the time on the clock within 5 days. In other words, each 5 days your circadian clock would be one time zone west of where you live and work. In 60 days, your circadian pacemaker would be one hemisphere away. Light is the key to why this does not typically occur. To be more specific, light information from the environment transmitted from the eye to the SCNs via a direct neural connection resets the circadian clock every day to the planet earth. Light is the most powerful synchronizer of the human circadian clock, and the timing of light exposure during the course of a day is responsible for how the circadian clock is synchronized to the environment. Circadian rhythm disorders form a distinct subgroup of sleep disorders. They lead to a mismatch between an individual’s natural sleep schedule and the timing of the desired sleep period. These conflicts arise from a biological predisposition and a variety of external pressures or lifestyle choices. These disorders result in fatigue, poor job or school performances, and sleep disturbances (especially difficulty falling asleep or waking up at desired times). Individuals who work at night are asked to perform their jobs at a time that conflicts with the sleep-wake regulating signals from the circadian clock. This mismatch contributes to reduced alertness and job performance, increased risk of workplace accidents or when commuting home, and abbreviated daytime sleep. After a night shift, workers may sleep one to three hours less than when working the day shift. By carefully selecting the duration and timing of light and darkness exposure, it is possible to help the circadian clock realign with work and rest times. However, phototherapy is not recommended in all cases and can also have side effects. A good management of sleep and naps is advised. Each year, millions of travelers suffer from jet lag after rapid travel across multiple time zones, causing substantial deterioration of vigilance and performance after arrival at their destination. In practical terms, the circadian clock takes longer to reach the destination than the person travelling by plane. The severity of jet lag depends on both the direction of flight and the number of time zones crossed. Eastward flights are associated with difficulty falling asleep, sleep disturbances in the first half of the night, difficulty awakening, and fatigue in the morning or early afternoon. Westward flights are associated with poor sleep quality in the second half of the night, early morning awakening, and fatigue in the late afternoon or evening. Advanced Sleep-Wake Phase Syndrome (ASWPS) is more frequently reported in older individuals. It is characterized by evening sleepiness, a tendency to go to bed early (from 18h to 21h) and early morning awakening (between 1h to 4h). Sleep quality is generally normal if individuals initiate sleep early, symptoms emerge when they stay up later. Familial cases of ASWPS, which causes a tendency to be an extreme early morning type in several family members, was associated with mutation of circadian clock genes. This observation supports the hypothesis that some circadian rhythms disorders have a genetic basis. 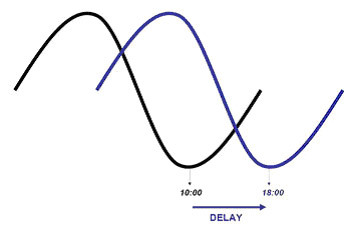 Delayed Sleep-Wake Phase Syndrome (DSWPS) is characterized by a delay in the main sleep episode and an inability to fall asleep or wake up at desired times. DSWPS patients are extreme «night owls», with bedtimes frequently observed around 3 to 6 a.m. and wake times around 12 to 15h. Sleep quality and duration are normal when individuals sleep at their preferred biological times. Symptoms appear when individuals force themselves to go to sleep earlier to accommodate early rising. This pattern results in a conflict with morning school or work hours. This syndrome often emerges after puberty and is more common among adolescents and young adults. Patients with this syndrome have sleep onset times that, each day, diverge by one to two hours from the previous day. Sleepiness and sleep disorders appear on the days when their internal rhythms are out of phase with habitual work-life constraints. The patients will have less difficulty adapting during periods their biological clock is synchronized to conventional society times. This condition does not occur frequently in people with normal vision, but blind patients lacking light input to the clock are more likely to suffer from this syndrome. Who is affected by sleep disorders? Approximately 25% of the general adult population has difficulties to fall asleep or maintain their sleep once achieve. The percentages are higher for people severely stressed by their schedule (40%), or those working on irregular shift work schedule (30%)(Data from Statistics Canada). There is no single factor that causes circadian rhythm sleep disorders. However, research findings suggest that some circadian rhythm disorders have a genetic basis. For example, familial ASWPS, which causes extreme "early-bird" tendencies in families, is related to a gene mutation. There is increasing evidence that disturbances of the circadian clock can contribute to the state of certain psychiatric conditions. Light-induced phase shifts in the melatonin rhythm could improve symptoms related to Winter Seasonal Affective Disorder and even depression. Sleep deprivation, light therapy and drugs improving sleep structure could be beneficial for major depression during the depressive phases of bipolar affective disorder. Recent evidence associating genetic components of the circadian clock with the likelihood of psychiatric disorders as well as with their targets for drug treatment continue to prompt interest in the interaction between the circadian clock and mental health. Most of us have an intuitive notion of our internal clock. To have ever experienced the symptoms of jet lag after a trans-oceanic flight is to become aware of the internal clock. For many, jet-lag evokes the feeling that the brain is in one time zone while the body is in another. Under normal circumstances, our internal clock (or circadian pacemaker) coordinates our internal daily physiology with the external 24-hour day-- keeping the brain and body in the same time zone. As a result, we generally sleep at night and are awake in the day. Our levels of alertness and our ability to perform will change throughout the day, but we can be at our best and worst at specific times of day. 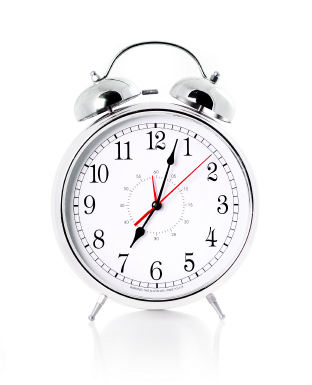 Flying across time zones or working night shifts put us at odds with our internal clocks. By changing bedtimes by about an hour each day before your departure, begin to adopt the sleep schedule of your destination time zone. If you're travelling east, start going to bed earlier; if you're travelling west delay your bedtimes. If you are flying within 6 time zones, try to adopt the schedule for sleep and meals appropriate to your destination as soon as you arrive. 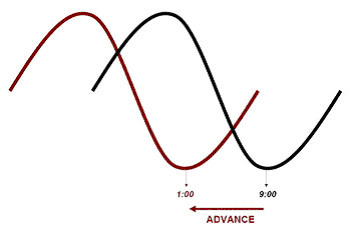 The day/night pattern in the new time zone will help the circadian pacemaker adjust. A nap in the plane prior to arrival or a short nap at the new destination can help to reduce fatigue on the day of arrival.